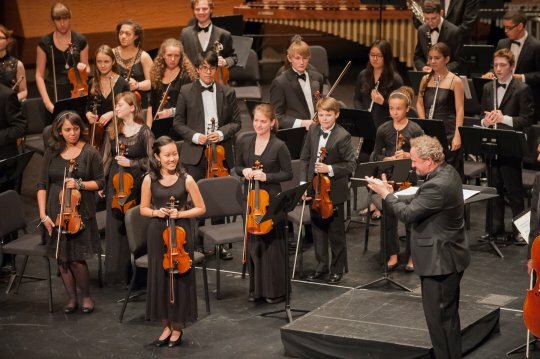 Young Audiences Arts for Learning is thrilled to have the ISO Symphony of the InterSchool Orchestras of New York performing at our Gala celebration on Thursday, November 20th at the Waldorf Astoria. The acclaimed Jeffrey Grogan will lead his students in a captivating performance. Grogan has been Education and Community Engagement Conductor for the New Jersey Symphony Orchestra since 2006. He leads the NJSO in a variety of concerts each season. He has also recently conducted performances with the Little Orchestra Society of New York, Adelphi Chamber Orchestra and the New York Concerti Sinfonietta. Jeffrey Grogan considers his work with young musicians one of the cornerstones of his career. He serves as conductor and Artistic Director of the Greater Newark Youth Orchestras, the InterSchool Orchestras of New York and the New Jersey Youth Symphony. Just this past season, his youth orchestras have performed to capacity crowds at both Carnegie Hall and the Musikverein in Vienna. He has recently appeared as a guest conductor at the University of Georgia, Indiana University, the Manhattan School of Music, and the Mannes School of Music Pre-College Division. I was lucky enough to interview him about his experiences teaching. Young Audiences Arts for Learning: What originally inspired you to become a musician and pursue music as a career? Was there a specific person in your life that influenced this decision? Jeffrey Grogan: I grew up in a very small town in Texas and when I was in fourth grade, I saw Star Wars for the first time. I eventually bought the two-record set and listened to it for hours on end each evening. My elementary school music teacher took my whole class to see the Dallas Symphony Orchestra and introduced us to all the instruments. She had a huge impact on my future life and career and I still keep in touch with her today. YA: How long have you been with the Interschool Orchestras of New York (ISO), and how did you first get involved with them? JG: This is my fifth season with ISO. In 2009, I was selected as a Bruno Walter Fellow through the League of American Orchestras. While conducting the Nashville Symphony at a Conductor Preview, I met several members of the ISO search committee and found them to be incredibly dedicated and inspiring. I started conducting with the ISO a short time later. YA: You are currently working with a professional orchestra (New Jersey Symphony) and three different Youth Ensembles (New Jersey Symphony Youth Orchestras, Interschool Orchestras of New York, and the NJ Youth Symphony) and have worked at numerous festivals as an adjudicator and clinician. What do you enjoy about specifically working with younger musicians? JG: Nothing compares to the energy, inspiration and work ethic of students rehearsing and performing the great repertoire for the first time. Participating in that process is the most rewarding experience on the planet. YA: Why do you believe that the arts are important in our children’s development and education? JG: Besides the enormous amount of scientific research pointing to the connection between music and brain development, music is also a form of universal expression and is extremely important. When many students are working together towards a common goal, it raises the bar for everyone in the group, instilling a sense of responsibility in their teammates. YA: What has been the most memorable experience in your career so far? JG: It’s very difficult to narrow it down to just one moment, but most of the memorable experiences have happened during rehearsals with young musicians. Concerts are great, but the real learning takes place during the rehearsal process - it’s certainly my favorite part. YA: What advice would you have for kids who may want to follow in your footsteps and pursue conducting or another aspect of music as a career? JG: Focus on becoming the best musician you can be. Lead by example and you’ll be amazed how things will just fall into your lap!